This is the only chocolate chip cookie recipe you will ever need. They are to this day my favorite cookies ever! Perfectly soft and chewy every time. When I say this recipe came from an actual bakery, I mean it. It wasn’t one of those recipes that came from an aunt’s cousin’s in-laws who used to work at a bakery. This recipe came from a bakery that I, myself, worked at. This is the EXACT recipe from that bakery. The bakery I worked at was the BYU-Hawaii campus (yet another place that I worked. Seriously, I had like 10 jobs when I lived there and I am not even exaggerating. If you are going to live in Hawaii as a college student you pretty much have to work 10 jobs just to survive. Baker, florist, waitress, cartoonist (yes, cartoonist)… you get the picture. I did it ALL.) Anyway, I am getting way off topic here. Back to the cookies. I LOVED the chocolate chip cookies that we made at the bakery. Not many things sound great at 4am.. but bakery chocolate chip cookies always did (and still do). They are so soft, chewy and DELICIOUS! You are going to love them. One of my favorite ways to eat them is chilled. At the bakery, sometimes the cookies would be chilled in the walk-in refrigerator and then given to employees the next day. You had better believe I was back in the fridge at 4am gobbling these up. Never got sick of them. The trick to getting bakery chocolate chip cookies all perfectly formed and the same size is using a cookie dough scoop. I bought mine at a local restaurant supply store, but you can find them online. At the bakery we would put on gloves, grab a big hunk of dough and scoop from our hand. I STILL like to do it this way, glove and all. I like using the glove because when I do scoops I scrape the scooper along the palm of my hand to round off the dough and it protects my hands. I love perfectly formed cookies that all look identical. Maybe that is my OCD coming out, but it is so satisfying seeing cookies all the same size in perfectly straight rows coming out of the oven. At the bakery we would make HUGE batches of these.. like MOUNDS of dough in GIGANTIC mixers. Obviously I don’t have a bear-sized mixer in my home so I had to figure out the correct measurements for a small batch. It took some time but I figured it out and it is PERFECT. So here is my recipe for perfect bakery chocolate chip cookies… I know you are going to love them! ***Use this recipe to make “Skookies”…. YUM! Cream butter and sugar, add eggs and vanilla, mix well. Mix dry ingredients and add to sugar mixture. Scoop with small ice cream scoop. Bake at 325 for 8-9 minutes. Do not over bake! I WANT TO MAKE THIS COOKIE. WHAT DO YOU MEAN BY 3 1/2 CUBES OF REAL BUTTER. DO YOU MEAN 3 1/2 CUPS OF REAL BUTTER. 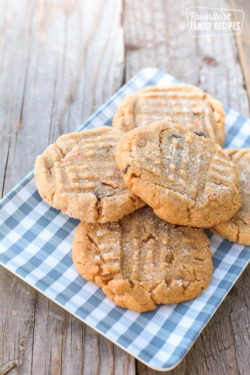 You will love these cookies! It is actually 3 1/2 cubes… so about 1 3/4 cups. THANKYOU VERY MUCH. WE ARE GOING TO MAKE IT TODAY. I'm trying your recipe tonight. Is the oven temp really 325? Because after 9 minutes the cookies were definitely not done. Should it be 375? I cooked them on convection @ 300 for 10 minutes..perfection. Made these cookies tonight… DELISH! Thanks so much for this blog… I use TONZ of your recipes. And I cooked mine on 325 for 8 minutes and they were no more than PERFECTO! They didn't look exactly like yours but so close… just not as cracky… more smooth 🙂 Is cracky a word? HAHA! YUMMO! These made good dough too 🙂 Love dough! Mine turned out a little crispy on the outside edge and bottom with the middle gooey. I probably have bad cookie sheets. What is your suggestion on cookie sheets? Where do you get them… Light, Dark, Specialty etc? THX!!! Oh, and they are still delicious! Maybe once they sit for a bit (like tomorrow) they will be divine! Sam’s Club sells a set of 1 half-sheets for a very reasonable price. They have edges so you can actually bake cookie bars/sheet brownies in them too. They rock! They are a light aluminum and you can find them with other kitchen supplies. Try USA pans! Amazon sells them. Made in PA and are the BEST cookie sheets ever! I second the USA cookie sheets. Cooks Illustrated recommended them and I love mine. I found this recipe around 2 years ago, I made it for the first time and fell in love – and have been using it ever since! 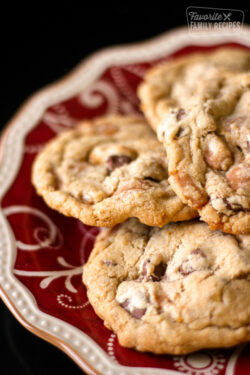 Chocolate chip cookies are my favorite dessert- and my hubby’s, too (well, the dough). I usually bake at 350 for 10 minutes, but every oven is different! But thank you for posting this recipe! It is already a family favorite, and the cookie my kids will grow up loving!!! ps – I freeze the cookies and eat them as a snack – so I always have my favorite dessert on hand! Sounds weird, but you should try it. It only takes a few minutes for it to defrost.. and I actually prefer them frozen now instead of “fresh-baked”. I think it helps you savor every bite! Katie, I have not made this recipe yet, but I definitely plan to because chocolate chip cookies are a must for that go to sweet snack after dinner. I noticed that you said something about freezing them and eating them as a snack. Do you mean you literally eat them frozen? If so, what about the raw egg? Aren’t you worried about that making you sick? BTW… I love cookie dough…???? I am so happy I came across this recipe on Pinterest!!! I have been on a search for the best chocolate chip cookies that don’t go flat on me!!! These are it!! They came out great, not flat, have a slight crisp to the edge but are chewy! The recipe made a TON of cookies and would have been a cinch had my Kitchen Aid mixer not died on me last week. I used my hand mixer and it was a bit of a chore. I had to play around with the time. I baked them at 350 and needed about 13 minutes but my scoop might have been a bit bigger than others. Yay! I am so glad that you like them! 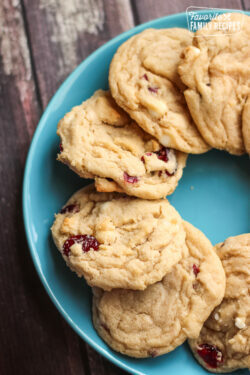 They are seriously my go-to chocolate chip cookie recipe. They always come out perfect and I always end up eating WAYYY too many. Hopefully you can get another stand-mixer soon so you can make them again and not have to do it all by hand! 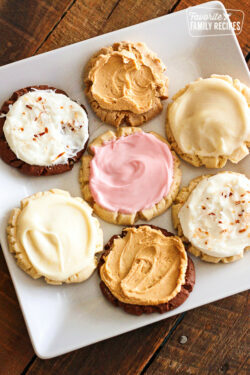 These cookies have a great look to them, just like bakery cookies. They came out perfectly round with soft crackly tops, and they stay nice and soft. My family really enjoyed these. I liked them also but felt that maybe an additional bit of salt could be added to balance out the sweetness, these do have a lot of sugar. I might try adding just a bit more of salt next time and see if that helps. Overall, these have the best look, texture, and chewiness than any other chocolate chip cookie I have made. Thanks for sharing! Hi there! I was just wondering about how many cookies does this make? Looks fabulous by the way!! This recipe makes a big batch of cookies. If you make large cookies, it makes about 6 dozen or so. 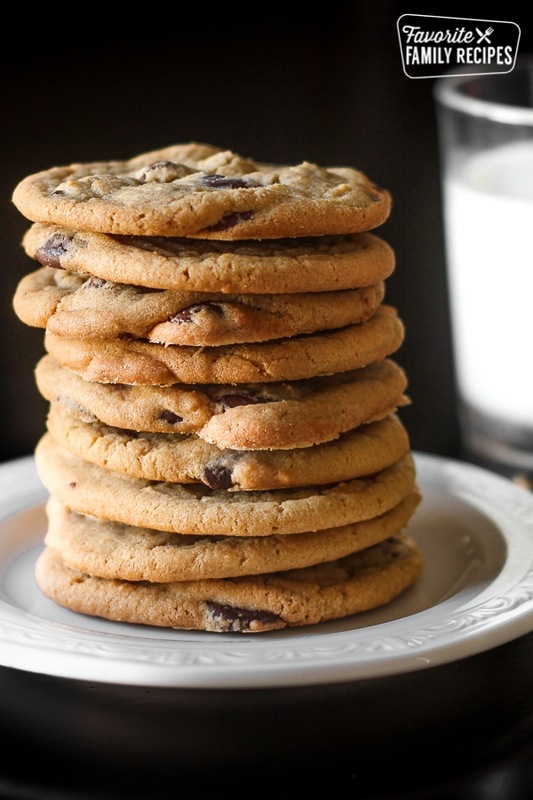 If you make an average size cookie – a heaping tablespoon of dough per cookie – it makes 8-10 dozen cookies. Fantastic recipe – and simple, too! My other favorite recipe is much more complicated and requires refrigeration, so this will be my new favorite! I would add that the bake time is increased when cooking with Silpat sheets, but perfect every time! We are so glad you like this recipe! We love it too! i am still not sure about the butter measurement. Is it 1 and 3/4 cups? They sound yummy! BYU-Hawaii!!! I loved my time spent there! What size would you say a small ice cream scoop is? 1/4 cup? I guess technically the “ice cream” scoop I use is a actually a “cookie dough” scoop. Think bigger than a walnut, smaller than a golfball.. hope that helps! Cubes are actually 1/4 stick of butter(2 tablespoon) so that measurement messed me up. I had made the cookie dough and realized it was not enough butter, so I had to add more at the end. They came out very small and rose too much, looked absolutely nothing like this. Would burn at the edges and not get cooked all the way through. Had an after taste to them. I will try next time to make these properly now I know you meant STICKS and NOT CUBES. Please change it! Thank you! Fixed it. 🙂 Sorry for the misunderstanding. Hopefully it is very clear on the post now! Love this recipe! Was just wondering if it can be made into bars (9×13)? Thanks for the recipe ???????? This recipe looks great! Back to the butter issue, recipe calls for 3 1/2 sticks but in parenthesis it says 2 3/4 cups? Thinking it should be 1 3/4 ????. Trying them today. Can you add pecans? If so how much? Sure! You can probably add 1-2 c.
You mention this being a “small batch,” however it’s not listed how many cookies this makes? Thanks. It depends on how big of cookies you make… typically we get about 3 dozen. little confused about recipe , you didn’t use any flour in recipe or there is any printing mistake? Flour is found in the ingredients list. In the instructions it is considered one of the “dry” ingredients. Hope this helps! Great cookies! Made for the first time the other night and the family was super pleased thank you so much! After 3 days the cookies are still soft and taste great . Only thing that was off for me was cooking time but not surprised as my oven cooks uneven it took 16 min to get a light gold color.